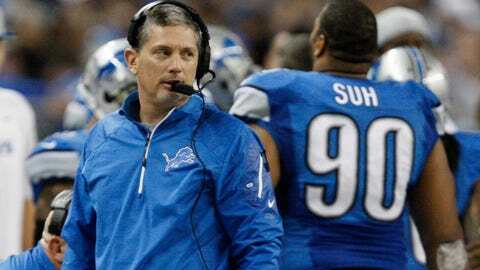 While his team was being eliminated from playoff contention, Lions coach Jim Schwartz lost his cool with the fans at Ford Field on Sunday. 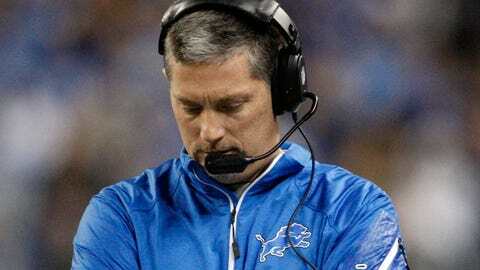 DETROIT — With the Detroit Lions’ playoff hopes slipping away Sunday at Ford Field, coach Jim Schwartz was angry and frustrated — with the fans. After the final play of regulation, with Detroit’s offense letting the clock run down and forcing overtime against the New York Giants, the FOX game broadcast clearly showed Schwartz turning in disgust and yelling twice in the direction of the fans. "I was disappointed to hear the boos," Schwartz said after a 23-20 OT loss that eliminated his team from playoff contention. "I thought our team needed to feel good about itself right then. "We had just intercepted a ball that got us to overtime. We’re trying to get our team ready, and that’s a tough situation when your players are getting booed." It wasn’t the first time the crowd had booed on Sunday. Fans were very vocal when the team left the field trailing 13-3 at the half, and again when Matt Stafford threw a pick-six that let the Giants tie the game with just under five minutes to play. But the next shower of boos came under different circumstances. Glover Quin’s interception had ended New York’s last shot at winning the game in regulation, giving the Lions the ball on their own 25 with 23 seconds left and two timeouts. Schwartz said that he had a plan that gave the Lions one chance to determine if they would go for the win or run out the clock. "We didn’t have great field position, but we ran a play that might bust out for a gain and get us down the field," Schwartz said. "If it had worked and at least gotten us a first down, we might have gone for it. "It didn’t, and I liked our chances in overtime." Did Schwartz have a trick play that might fool the Giants and set up a David Akers field-goal attempt? Did he dial up a bomb to Nate Burleson or even a hobbled Calvin Johnson? Not exactly. The play that didn’t quite bust open the game was a vanilla dive up the middle with third-string running back Theo Riddick. They did it their way -- the Detroit Lions' way -- with one more collapse that ends their playoff hopes. Riddick gained six yards, and the Lions trotted off the field to get ready for overtime. That’s when the fans began to boo, with their anger seemingly directed more at the conservative play-calling more than the players. Schwartz was talking on the headset as the clock ran down, then turned and shouted at the crowd with a disgusted look on his face. He glanced back toward the field, then turned back to the fans for another salvo. At that point, the cameras cut to a shot of Stafford walking off the field. Schwartz said he wasn’t addressing specific fans, just expressing general frustration with the crowd. "I don’t know how you cannot (pay attention to them)," he said. "Our fans have been great for us, but we needed them on our side in overtime. "It wasn’t like we were running another play when I was doing that. We were getting ready to go to overtime." Schwartz was asked if Detroit’s collapse from 6-3 to 7-8 played into his frustration with the fans, but the Lions media-relations representative shut down the press conference before he could answer. Two of the team’s most-popular players shared their coach’s disappointment with the Detroit crowd. "If Coach did that (yelled at the fans), I’m not mad at him," receiver Nate Burleson said. "When the fans are booing that loudly when you still have a chance to win the game, that’s tough to take. "I’ll be honest, I wanted to turn around and say something more than once. I get it. The fans are frustrated, but they should know that it is much worse for us. "You want to say something, but I’ve been in this league long enough to know that it doesn’t help." Like Burleson, running back Reggie Bush understood the fans’ anger, but said that being booed by the home crowd is tough for any athlete to take. "Of course it affects us," Bush said. "We’re human beings out there, not mannequins." Certainly, getting jeered by 60,000 fans can’t be easy, especially when you’re heading to overtime with the season on the line. But Schwartz can’t be a successful coach if booing fans make it difficult for him to motivate his team when so much is at stake. Plus, he had to know that most of the booing was directed at him, not his players, for not trying to win in regulation. At one of the biggest moments in his coaching career, Schwartz focused on the fans instead of his team, and even it was only for a few seconds, that’s not something he should’ve done. One of the biggest criticisms of Schwartz as a coach has been his inability to keep himself and his team disciplined. Sunday, he put another minus sign into that part of his ledger.